Neuronal migration disorders refer to a wide spectrum of developmental malformations of the cortex caused by disruption to its normal process of formation, which includes proliferation, migration and organization. We illustrate case of a 2 year old male child who presented to us with complaints of delayed milestones of development since birth with multiple episodes of generalized tonic clonic seizures. Physical examination revealed a depressed anterior fontanelle. 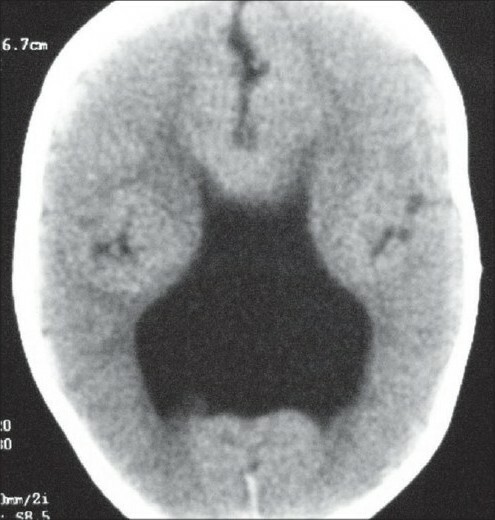 Computed tomography scan showed the presence of lissencephaly, colpocephaly and septal agenesis. This constellation of findings makes the ventricular system appear in shape of a crown of a king on the un-enhanced CT scan. Hence, we refer to this as "CROWN SIGN", not previously described in neurosurgical literature. The child was started on anti-epileptics and cerebro-active agents. He showed gradual improvement on follow up with neck holding coming up as the first positive sign. Isolated defects are common but sometimes they occur in varying degrees of combination, giving a unique appearance on the imaging studies, as has been exemplified in our case. A 2-year-old male child presented to us with complaints of delayed motor, language, and psychosocial milestones of development since birth. At the time of examination, there was no neck holding. For the last six months, the child also had multiple episodes of generalized tonic-clonic seizures. The perinatal period was insignificant. There was no positive family history. Physical examination revealed a depressed anterior fontanelle. 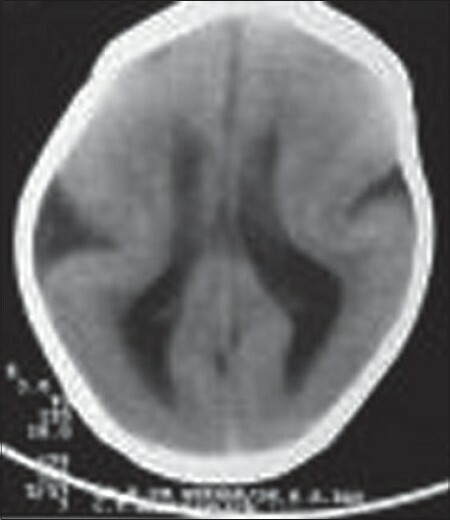 Computed tomography (CT) scan was done, which showed the presence of lissencephaly (pachygyria-agyria complex) [Figure 1] with predominant enlargement of occipital horns (colpocephaly) [Figure 2]. Septal agenesis was also present, although the interhemispheric fissure was well developed. Dandy-Walker variant was present as an additional finding [Figure 3]. 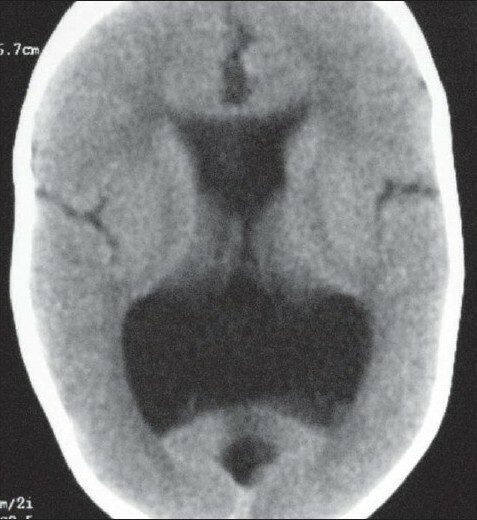 This triad of lissencephaly, colpocephaly, and absence of septum pellucidum gives a unique appearance to the ventricular system in form of a crown of a king on the unenhanced CT scan. Therefore, we refer to this as 'CROWN SIGN,' first described in neurosurgical literature [Figure 4]. This terminology has been used to provide a quick insight about the pathology that is being dealt with. The presence of 'CROWN SIGN' indicates that we are dealing with syndromic triad of lissencephaly, colpocephaly, and septal agenesis. The child was started on antiepileptics and cerebroactive agents. He showed gradual improvement on follow-up, with neck holding coming up as the first positive sign. Cortical malformations manifest clinically by producing seizures, mental retardation, and focal neurological deficits. Most frequently, patients experience medically refractory epilepsy, whose degree of severity and time of onset is variable. Other features include feeding and swallowing problems, muscle tone anomalies (early hypotonia and subsequently limb hypertonia), and severe psychomotor retardation. , CT changes of lissencephaly include lack of cortical sulci and gyri; calcification in the region of paraphysis; wide, shallow sylvian fissures; colpocephaly; poor development of white matter; and persistent cavum septum pellucidum and cavum vergae. Isolated defects are common but sometimes they occur in varying degrees of combination,  giving a unique appearance on the imaging studies, as has been exemplified in our case. 1. Hayward JC, Titelbaum DS, Clancy RR, Zimmerman RA. Lissencephaly-pachygyria associated with congenital cytomegalovirus infection. J Child Neurol 1991;6:109-14. 2. Pavone L, Rizzo R, Dobyns WB. Clinical manifestations and evaluation of isolated lissencephaly. Childs Nerv Syst 1993;9:387-90. 3. Verloes A, Elmaleh M, Gonzales M, Laquerriere A, Gressens P. Genetic and clinical aspects of lissencephaly. Rev Neurol (Paris) 2007;163:533-47. 4. Williams JP, Joslyn JN. Lissencephaly: computed tomographic diagnosis. J Comput Tomogr 1983;7:141-4. 5. Dobyns WB, McCluggage CW. Computed tomographic appearance of lissencephaly syndromes. 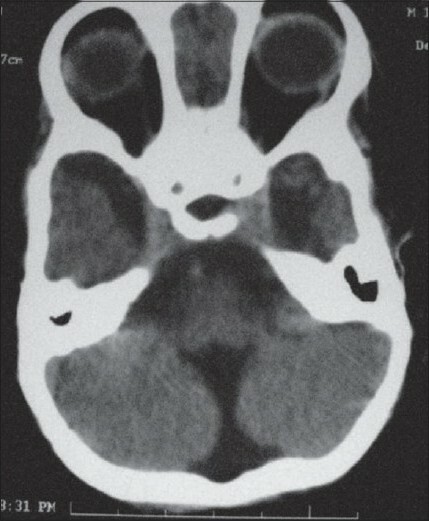 AJNR Am J Neuroradiol 1985;6:545-50. Patnaik, A. and Mishra, S.S. and Mishra, S. and Das, S.